We have all had itchy skin from time to time, whether it is from poison ivy, eczema, or dry skin. It is always nice to have a good home remedy available that really works. 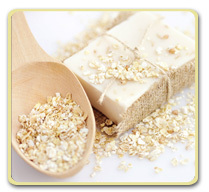 An oatmeal bath is a great alternative to anti-itch medications. People have actually been using oatmeal to sooth irritated skin for centuries. How does oatmeal stop the itch? Oatmeal contains vitamin E and other compounds which have anti-inflammatory and antioxidant properties. It contains starches and beta-glucan, which act to help moisturize the skin. It contains polysaccharides (a form of sugar) which act to bind water, and create a protective barrier to help keep the skin from losing excess moisture. It acts as a buffering agent, to help skin maintain a balanced pH. It reduces the rate of histamine release from mast cells, which is part of a normal allergic skin reaction. It helps to cleanse the skin because it contains saponins, which have soap-like activity. Is this the same oatmeal you eat for breakfast? The answer is yes and no. You don't just pour old fashioned oats into your bath. The kind of oatmeal that you put in your bath is called colloidal oatmeal. You can make colloidal oatmeal from old fashioned oats, the same kind you eat for breakfast. You can also buy over-the-counter colloidal oatmeal specifically made for using in a bath. How do you make your own colloidal oatmeal? You will need to start with whole, old fashioned oats, not instant oatmeal or quick cooking oats, without any sugar, salt, or flavorings of any kind. Put the dry oats into a clean blender or food processor and grind them into a fine powder that is just a little more course than flour. Test it to see if it is the right consistency by stirring a teaspoon of the powder into a glass of warm water. The water should turn milky white, with almost no sediment on the bottom. How do you prepare an oatmeal bath? If you are using an over-the-counter colloidal oatmeal product, there will be instructions on the package. If you are using your own, homemade colloidal oatmeal, add ½ to 1 cup of the colloidal oatmeal to a tub of warm water. Water that is too hot can worsen itching, so avoid hot water. Limit your bath time to 15 minutes, which helps avoid losing your skin's protective oils. Be especially careful when getting out of the tub, because colloidal oatmeal can make the tub slippery! Pat your skin dry as soon as you get out of the tub, then apply a good moisturizing cream. I would love to hear how this works for you the next time you have itchy skin. If you have itchy skin that does not improve with this home remedy, send in your question to one of our doctors. We are here to help.